Satisfying Direct Mail with Digital. Color Inkjet with Production Capabilities. Impact, a direct mail marketing provider, began in 1985. Today the all-digital company is situated in two locations and employs 180 staff members out of 175,000 square feet of production space. Its roots are in direct mail, both residential and occupant. Print collateral offered includes inserts, letters, statements, and self mailers. The Minneapolis, MN-based business divides its service offerings into three segments. Manufacturing includes print, mail, order processing, and distribution. Analytics involves front end modeling, lists, profiling and segmentation, and sales analysis. Lastly, applied technology services encompasses multi-channel, marketing automation, and critical document services. Above: Direct mail marketing provider, Impact, uses an Oce VarioPrint i300 sheetfed color inkjet press and Oce ColorStream 3900Z continuous feed color inkjet press from Canon Solutions America. Serving the entire U.S., Impact has had a hand in digital printing technologies for the last 20 years, specifically using black toner and soon after color toner. About six years ago, Tim Johnson, CEO, Impact, began considering color inkjet and installed the technology about three years ago. Johnson says Impact’s goal is to help its clients practice effective direct marketing with color inkjet. “We believe that if we don’t take care of our customers, someone else will. We are happy with our decision to implement color inkjet and more importantly the timing of that decision. It’s placed us on the way to achieving our goals,” he continues. For digital printing, the company uses an Océ VarioPrint i300 sheetfed color inkjet press and Océ ColorStream 3900Z continuous feed color inkjet press from Canon Solutions America. Both printers were purchased at the end of 2015. The Océ VarioPrint i300 outputs up to 294 letter images per minute in duplex mode. It targets heavy production volumes and supports paper sizes up to 13.9×19.7 inches at 600×600 dpi with drop size modulation. Equipped with 12 paper trays, it runs both standard offset and inkjet substrates from 16 lb. bond to 110 lb. cover sheets. The printer is powered by Océ iQuarius aqueous pigment inks. The Océ ColorStream 3900Z achieves a maximum print speed for letter pages per minute of 1,818 in a twin system setup. It can be configured with up to six colors for monochome, full color, and special inks such as MICR or security inks. Unique to the ColorStream 3000Z series is the z-fold paper support. This offers an optional integrated stack in-feed and output for short-run stacked paper production. Speed, quality, and cost effectiveness all play a large part in the successful adoption of both the Océ VarioPrint i300 and Océ ColorStream 3900Z into Impact’s workflow. As a high-volume shop, the devices’ high-speed capabilities are essential. Similarly, Its customers expect quality products and Johnson says both printers’ quality are high for the direct mail products being produced. That said, cost effectiveness was the final defining factor. “Considering our volume and the capital required to purchase the presses, it proved to be a good investment. 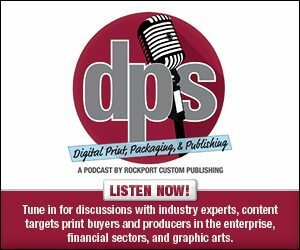 The capability of printing full color and personalizing in one pass makes the economics work,” says Johnson. Impact complements its digital printers with finishing capabilities including perforating, cutting, folding, card affixing, camera verification, and inserting. With 90 percent of the work on the two Océ presses involving direct mail, digital printing’s influence on this segment of the industry is evident. Because direct mail can be personalized with color when using digital, testing is also easier. This is a key element to most direct mail campaigns. Niches like non-profit, retail, financial, and insurance all require testing with their direct mail pieces and personalization capabilities make testing much easier. “However, certain types of personalization are not scalable without this technology. For example, if a non-profit wants to put a personalized, attention-getting, white message in the middle of its branded green color, that is not possible to do on a large scale without digital printing technology,” says Johnson. One of Impact’s customers is a large retail home furnishing client. “They do sell online, but retail stores drive their success. Our client utilizes multiple channels in their marketing efforts including television, radio, circulars, and digital print,” explains Johnson. Impact functions as an extension of the company’s marketing department by managing of all of its direct mail programs—data, print, and mail. The data that Impact collects using the customer’s Marketing Information System allows it to craft specific mail pieces for the correct audience. The home furnishing company realizes how valuable data is to targeted mail campaigns and is open with Impact, providing access to primary customer research. Combined, all of this information helps Impact meet the company’s main goals for marketing efforts—drive traffic to stores and increase sales. Impact conducts an analysis of eight monthly direct mail campaigns every quarter. Each analysis measures five key performance indicators—aggregate shopper count, aggregate total sales, direct mail average ticket, direct mail response rate, and the ratio of advertising dollars spent on direct mail to direct mail sales. Part of the process involves recommendations on whether to expand, continue, or decrease various direct mail campaigns. The eight direct mail campaigns are usually printed with a combination of digital and offset devices. Approximately 3,500,000 pieces are distributed per quarter. “Our biggest challenge is helping our retail client sell more and keep improving the results that we’re getting from direct mail. Like most brick and mortar retailers, figuring out its marketing mix and promoting online versus in-store sales is an apocalyptic challenge at this moment in history,” admits Johnson.